This report is best viewed on a widescreen desktop monitor, but may be generated on mobile and tablet devices. The results of this report, as mentioned here, pull entirely from Shift Pay Rates. The Hours durations for all Users are calculated entirely via Time Punches made by the Users during Shift Operations, or by Admins after the fact. You can modify Hours and Pay Rates accordingly, prior to running your final Payroll Report cycle, by visiting Shift Details and the Shift Edit Form, respectively. Note: You can also Bulk Edit Shift Pay Rates for more than one Shift at a time. A good example would be a rate change for an entire class of individuals (say... 1099), at a given Location during a given interval. The Mobile App allows Users working Shifts to actively manage Time Punching in real-time and connects that to location data offered by the device. This shifts the administrative overhead from managers to officers in a very fluid and natural way, and builds in accountability through location services. As mentioned above, Time Punches are required to run Payroll. If you have another system that handles Time Punching, you can use the Agenda to Bulk Add Time Punches to Scheduled Shifts. This can cut down on the time spent prepping your Payrolls in that scenario. 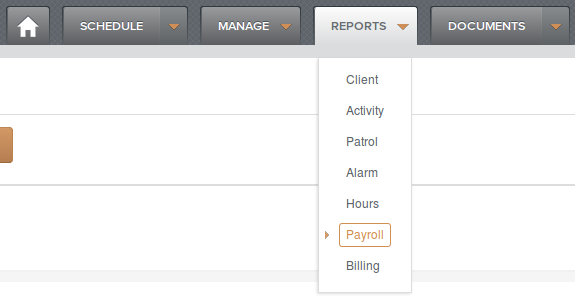 Note: Admins can access Payroll Reports by clicking on the Reports menu drop down. Payroll Report intervals and start Date/Times are governed by Payroll Settings. Be sure to read through and understand how those settings apply. As mentioned, we are only calculating overtime after 40 hrs/week. We plan on introducing more nuanced overtime calculation to account for states like California and Maine. Coming soon! Those values are calculated for all Shifts in the entire Report. The Shift rows are then broken up by the same line as the Cumulative Grand Total line, only with totals being calculated on a per User basis. The User Total rows come after that particular User's Shift Rows. Make your selections and click GENERATE to view results. User input Clock In values via the Dash or Mobile can tend to vary greatly depending on circumstances. In order to reign in abuse of early Clock Ins on the final Payroll, we've added a toggle that allows Admins to exclude any Clock In value that comes prior to the Start Date/Time for Shifts. All Start Date/Time values will assume the Shift Start Date/Time if this toggle is activated. The results are ordered by User Last Name ascending and represent only the cumulative User Totals found in the Detailed Report (below). The Header features the Franchise Name along with the Payroll Interval. The rest reflects the info seen in the Summary CSV Export described above. Early, Late, Incomplete & Split may appear in any combination. Note: No Punches & Incomplete Shifts appear in red, and clicking on the Shift # link will open that Shift Detail page for quick Time Punch editing. The rest reflects the information described above for the Detailed CSV Export. This appears at the bottom of the User Sample, seen above. The User Totals occur for every User having worked a Shift during the Payroll interval. Note: If the Paid Lunches toggle is NOT selected, the Lunch Punches will come out of Regular Hours. This may affect Overtime, and is actually much more accurate than legacy Payroll overtime calculations.